Sun City Hilton Head is consistently ranked as one of the best 55+ communities in the country. There are a great deal of incredible Del Webb communities spread throughout the country that are sure to impress, but North and South Carolina are home to several that are definitely worth taking a look at if you’re in the market for a new home. Each of the communities that we’ve highlighted below features the modern amenities that are synonymous with the Del Webb brand as well as a myriad of floor plans and price points that will fit almost any style and budget. Located just a short drive from historic downtown Charleston, SC is the Del Webb at Cane Bay community in the charming town of Summerville. It’s home to 1,000 single-family residences that are available on a resale-only basis. The gated, age-restricted community is spread across 360 acres that blend nature, homes, and amenities together. There are six home collection designs that range in size from 1,109 to 2,722 square feet in living space. They were designed with spacious great rooms, open kitchens, and charming front porches. Choices can also include one to four bedrooms, one-and-a-half to four baths, and attached garages. Cane Bay boasts several resort-style amenities, including a state-of-the-art fitness center, indoor lap pool, outdoor resort-style pool, aerobics and dance studio, plus, an arts and crafts studio. Outdoors there are four tennis courts, two pickle ball courts, and four bocce ball courts as well as a dog park, fishing lake, plenty of natural spaces, and walking and biking trails to keep residents active. Along with Cane Bay’s 20,000 square-foot clubhouse, the expansive event lawn is a hub for socializing with plenty of live entertainment, movie nights, and social events scheduled throughout the year. The community is also conveniently located near shopping, dining, and cultural amenities as well as a number of healthcare facilities, and the Charleston airport. Only 30 minutes from Charlotte, NC’s Uptown, Sun City Carolina Lakes in Fort Mill, has become one of the most sought-after 55+ communities in the area. Originally built in 2005, the large community is made up of 3,160 houses and has a combination of single-family homes, carriage houses, and townhomes available on a resale basis. There’s a multitude of layouts and sizes to choose from that are sure to suit any lifestyle. 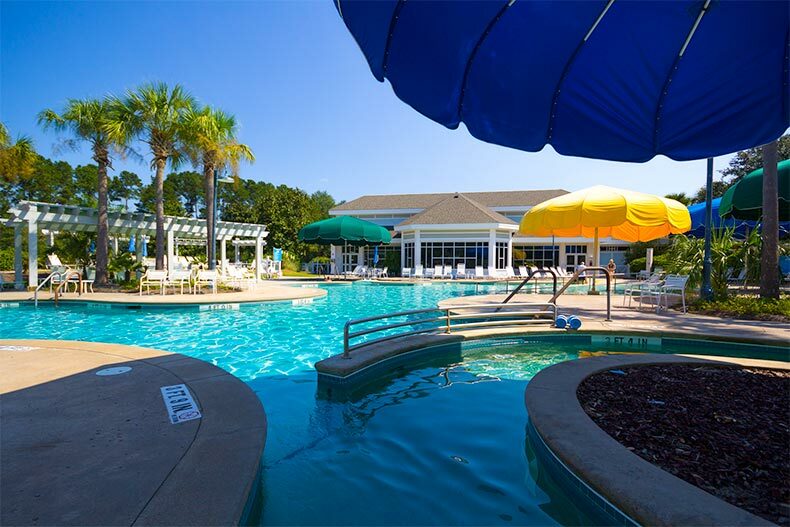 Amenities within Sun City Carolina Lakes include an 18-hole golf course, indoor lap pool and outdoor resort pool, on-site restaurant, fitness center, plus, an indoor walking track for when the weather isn’t perfect outdoors. Other luxuries that go above and beyond the typical amenities found in most communities include a sewing studio, woodworking shop, card room, demonstration kitchen, computer lab, ballroom, cafe and coffee shop. Additionally there’s a fishing lake, canoes, and kayaks to enjoy. And, for residents looking for more to do, Charlotte’s entertainment options and wealth of activities are only about 25 miles away. With a little over 8,000 homes, Sun City Hilton Head is the largest active adult community in the state of South Carolina. This Lowcountry community offers potential homebuyers a wide range of price points. There are many housing options for potential residents to consider from large 4,000 square foot single-family homes to smaller villa townhomes that are 1,000 square feet in size. Aside from the large variety of homes to choose from, one of the community’s biggest draws is the 45-acre town center and amenity complex designed to mimic a traditional town square. There are also two Jameson’s Grilles on-site, multiple fitness centers with top-notch cardiovascular and weight equipment, two indoor lap pools, photography studio, performing arts center, and dog park. Golfers will appreciate the multiple 18-hole golf courses, while residents who love to fish can take advantage of the 20-acre fishing pond. As an added bonus, there’s both RV and boat storage available within Sun City. Situated near the scenic NC Coast is one of Del Webb’s more quaint communities, Del Webb Wilmington, which has just under 550 houses in the neighborhood. Only new homes are available for purchase. Housing options span three different home collections that offer homeowners lots of choices when it comes to floor plans and design. With these options homes can range in size from 1,262 to 2,565 square feet and have as many as three bedrooms, three bathrooms, and two or two-and-a-half-car garages. Notable amenities on the property include a clubhouse, outdoor pool and patio, walking and biking trails, parks and natural spaces, plus, tennis, pickleball, and bocce ball courts. Even though the Carolinas offer plenty of quality Del Webb communities already, more are on the way. Two of Del Webb’s newer communities that potential homebuyers should keep on their radar are Del Webb at Traditions in Wake Forest, NC and Del Webb Charleston at Nexton in Summerville, SC.